Thank you to Karen Scarfone for doing editorial reviews on over 300 MDN pages, including 150+ of the Web API docs, which are a high priority for Firefox OS. MAKER PARTY: New York, USA: Global Kids Game Design Summer Camp for middle school and high school students, covering the concepts of game design including prototyping, idea development, iteration and more. It's intern presentation season! Starting at 1pm in 10 Forward, the SF Commons, and TOR Commons. Come see Jason Shun, Jack Montgomery and Subhadeep Paul present all the glorious stuff they've been working on this summer! MAKER PARTY: Warangal, India: The Maker Party with KIDS event helps children learn about the history of Fort Warangal and make a #makerparty Popcorn video on it. MAKER PARTY: New York, USA: two-day digital arts #makerparty program for high school students at the DreamYard Art Center. Learn basic computer skills, photo and audio editing, and how to use social networks. MAKER PARTY: New York, USA: three-day Fashion Design workshop for high school students to visit fashion designer Alpana Bawa and design their own fashion piece. FxOS UX Team is presenting some work from the Future Themes track. The times are 10am PST and 5pm PST in the Gaia UX vidyo room (1.5 hours in duration). Please contact Jaime with questions. MAKER PARTY: Noord-Scharwoude, The Netherlands: Playing with Thimble and Popcorn, Webmaker at OHM2013 participants will explore concepts of interest-based learning through tinkering with Mozilla Webmaker tools. Intern presentations starting at 1pm PDT in 10 Forward and the SF Commons. Come see Brandon Kase, David Zbarsky, Tim Kuehn, and Mohammed Almeshekah present all the glorious stuff they've been working on this summer! MAKER PARTY: Tîrgu Mure, Romania: Webmaker Party at IP Workshop 2013 with presentations about the web, html5, FirefoxOS, Mozilla Marketplace and how people can bring their contribution to Mozilla. MAKER PARTY: Maidstone, United Kingdom: For the International Scouts Jamboree, three thousand scouts from around the world will report on their week at camp and create a Popcorn video! MAKER PARTY: CERN Summer Webfest 2013 CERN, Meyrin, Switzerland: a grassroots initiative by summer students to spark new ideas on web-based education about CERN, the LHC and particle physics. MAKER PARTY: Jaipur, India: Jaipur National University will hold their Firefox Elections to help hold #makerparty events. MAKER PARTY: Rankin, Pennsylvania, USA: Build a piece of salvaged public art at the Carrie Furnaces in Rankin to display alongside the famous Carrie Deer. MAKER PARTY: Boston, Mass., USA: #MakerParty at the MIT Media Lab. Show up, hang out at an activity station (or three), and make stuff! Background Thumbnails (bug 870100) - Landed in Nightly. You shouldn't see "blank" thumbnails on the New Tab page anymore. Riding the train to Aurora next week. Please file bugs. About:Home hackathon wrapped up on Friday. Lots of fixes and features landed on the Fig branch. Planning to merge to Nightly early in Fx26 cycle. New 'selected text' actions landing in Nightly: Quick search and Find in Page. Guest Mode (Share your Device) work is coming together with a goal of making it for Fx25. Maker Party: events happening this week in the Netherlands, New York, India, Romania, MIT Media Lab, at an international Boy Scouts Jamboree in the UK, and hacking physics at CERN in Switzerland. 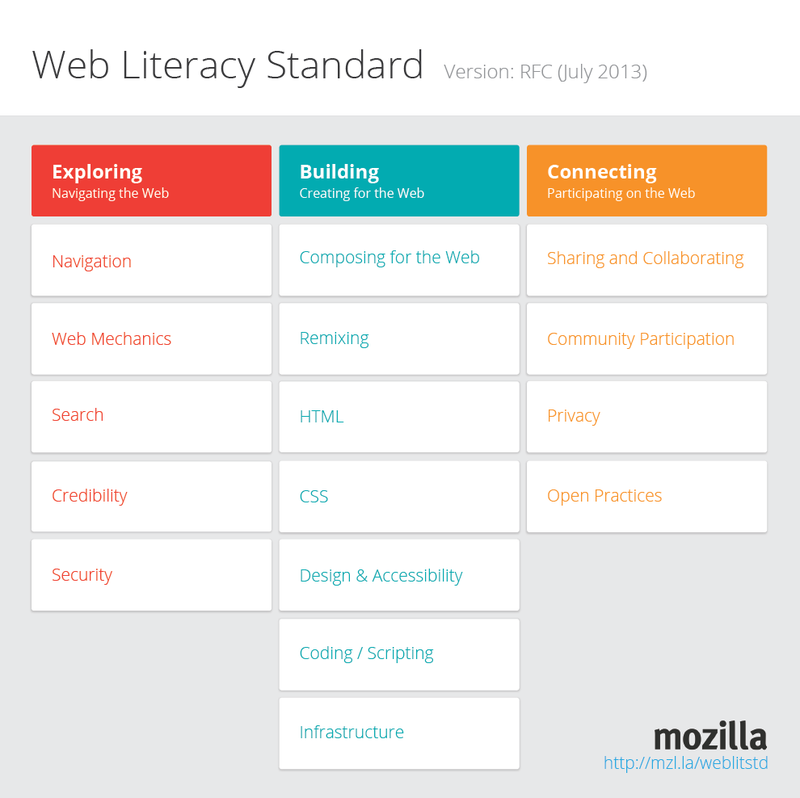 Web Literacy Standard (beta): What are the skills people need to be "web literate?" Introducing our new "Web Literacy Standard." A beta version of the skills and competencies needed to read, write and participate on the Web. Big News: Gmail identity bridge is live! Now whenever you log into a site that uses Persona with a gmail email address, you can authenticate directly with Google. No new passwords! For those having trouble signing into Mozilla properties with your LDAP credentials: If you have third-party cookies disabled, then white-list `login.mozilla.org` in the `Exceptions` menu. If you still need assistance, please visit #identity on IRC. Planet Firefox OS will be available soon for aggregating blog posts by the Firefox OS community. Send Dietrich the URL for the feed of your Firefox OS tagged posts if you'd like to be syndicated on that planet. BTW, lots of great comments to read about the landslide at the 2008 Summit. Mozilla's external DNS is now (mostly) served by Akamai. This gives us 100% uptime and a faster, anycast based geo-located service which means a faster, better service for our end users. Do you have a question about a Mozilla Project or initiative? Let us know by Friday - we'll do our best to get you an answer. gfritzsche, plugins FirefoxOS dogfooding What is the FxOS dogfooding process? Is there an outline for which builds to test, feedback channels beyond obvious bugs, ...? David (Satdav), Contributor For Potch regarding all hands meeting Can we move the meetings to suit the France office a bit better, as would be good to get them on the call? David (Satdav), Contributor For potch regarding all hands meeting Can we remove the thunderbird section to the non speak as it seems we never get any updates from them?